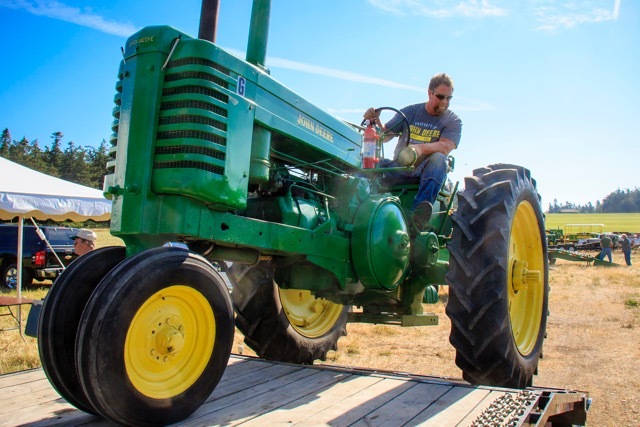 Like classic cars, two-cylinder John Deere tractors hold their appeal, and men with farming blood running through their veins, such as Bob Engle, collect them. Engle’s family farm on Fort Casey Road dates back to the 1850s, when his ancestors arrived to claim land as part of the Oregon Donation Land Claim Act. The Cascade Two-Cylinder Club (C2CC) approached Engle and asked him to hold a rally at his family farm. The club serves nearly 200 members throughout the northern part of the state, including Lynden, Sedro Woolley, Anacortes, Bow, and Whidbey Island. 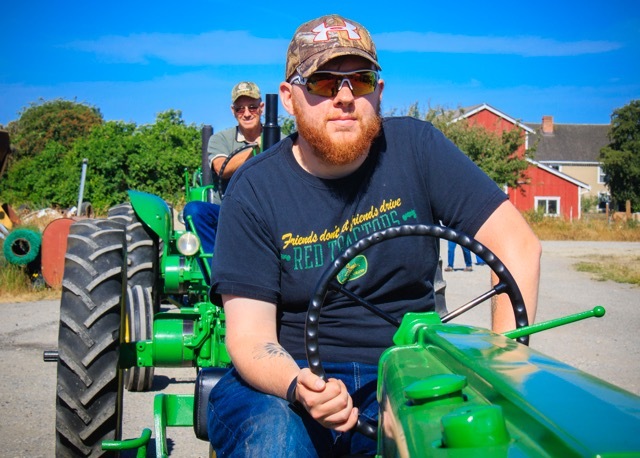 The nonprofit club, formed in 1993, is made up of collectors who restore and preserve antique John Deere farm equipment and who gather throughout the year for parades, plow days, festivals, and tractor pulls. C2CC is named for its dedication to preserving the legacy of two-cylinder John Deere tractors, which were built until 1960. Paul Hieb, president of C2CC, says it was the club’s first visit to Whidbey Island. 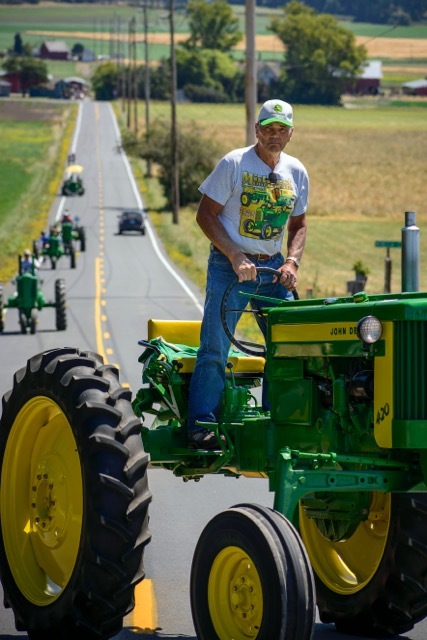 He trailered his 425 Hi-Crop from his farm outside Sedro Woolley, where he still grows potatoes, cauliflower, and broccoli. 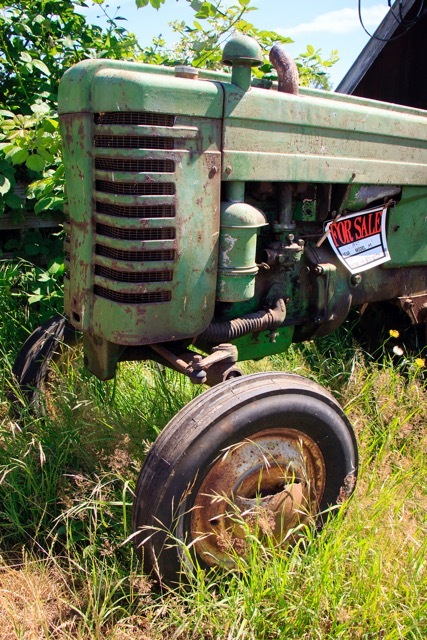 John Deere, a blacksmith, revolutionized the Midwestern farming world in 1837 by using a broken saw blade to create a self-scouring steel plow that the heavy clay soil of the prairie wouldn’t stick to. He went into production, and the company has since grown to become an international manufacturer of equipment used in agriculture, construction, forestry, and landscaping. Between the late 1920s to 1960, the John Deere company built more than 1.25 million two-cylinder tractors that were sized for the needs of small family farms. Then the industrializing of agriculture called for larger equipment, and two-cylinder tractors gave way to four-, six-, and eight-cylinder tractors, as well as turbo-powered machines. C2CC member Aldon Boon owns two two-cylinder John Deeres and co-owns a third with his son Zach who owns another on his own. The Boon family ran a dairy and chicken farm in Oak Harbor for years until they sold the property in 1999. Like Bob Engle, Aldon Boon never got tractors out of his blood. “When we were married in 1979, we milked 300 cows a day,” says Corinne Boon, who married Aldon right after high school. For Aldon’s 50th birthday, she bought him a 1940 John Deere tractor, which he restored to pristine condition. Now, living in the suburbs of Oak Harbor, Aldon, who works for the City of Oak Harbor, keeps his pristine collection housed in sheds and takes them out for club events. Zach Boon drove one of the tractors as part of the parade, towing an antique wagon on which his wife Miranda and baby daughter Anabeth sat. Corinne rode in the wagon, too, with her good friend Amy Hauser and their pair of smooth collie dogs, who lifted their noses at the scents that rolled by. Along the way, visitors stood on the side of the road and waved at the spectacle. Corinne says that another of their four sons works on a large-scale dairy farm in Arizona, which milks 10,000 cows daily. 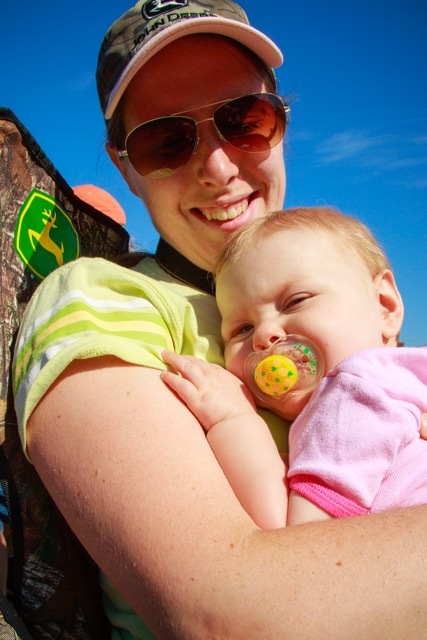 Ironic, she mused, that big operations, such as the one where her son works, are the ones that put the family farms owned by her parents and the Boons out of business. 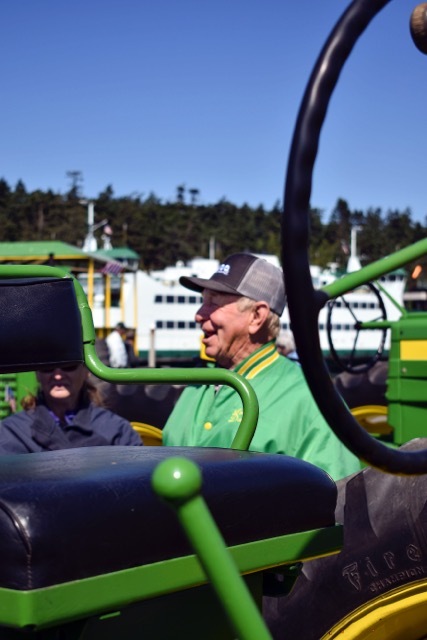 Loren Dahl, C2CC vice president, reminisced about the simpler days of easy-to-fix two-cylinder tractors, which he used when he farmed for years in the Skagit Valley raising beef cattle and growing hay. He pulled out his phone and proudly showed photos of old potato harvesters he collected that looked like pole diggers. Then he scrolled to a photo of a red monster machine that his son drives to harvest potatoes all at once and shook his head at how times are changing. Heib weighed in on the conversation, saying he buys old junker tractors and scavenges their parts to keep his collection of beauties up and running. 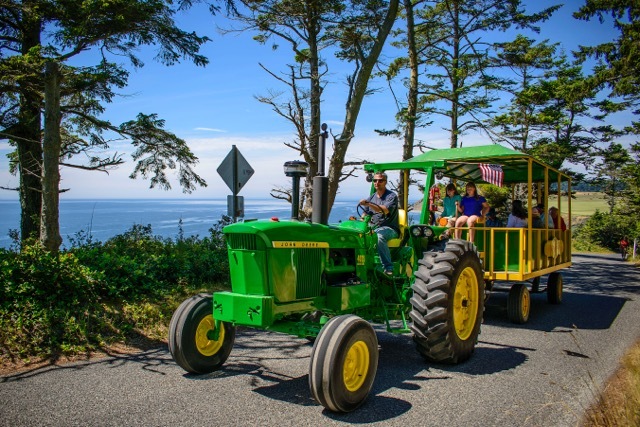 After club members drove their tractors in a parade around the Ebey’s Landing Historic Reserve, they gathered for lunch and talked good-naturedly while balancing their paper plates piled high with ham, baked beans, and potato salad. Then they headed out for another tour, this time to the Sunnyside Cemetery, which would have delighted many of the old farmers buried there who once used tractors just like them to till the prairie. Kate Poss worked as a library assistant at the Langley and Coupeville libraries before retiring last year. She worked for three summers as a chef aboard a small Alaskan tour boat from 2008 to 2010. Poss was a newspaper reporter in Los Angeles for many years before moving to Whidbey Island where she likes cooking for new and old friends, hiking, reading great fiction, and writing her second novel with friend Fred Bixby. 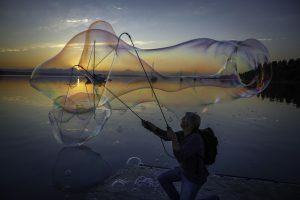 David Welton is a retired physician who has been a staff photographer for Whidbey Life Magazine since its early days. His work has also appeared in museums, art galleries, newspapers, regional and national magazines, books, nonprofit publicity, and on the back of the Whidbey Sea-Tac Shuttle! Nice article. I wish we had known about this ahead of time. It would have been great to see them! Thanks for writing. The tractor parade was a lot of fun. If you want to find out more about them, click the link for the Cascade Two-Cylinder Club in this article. Then you can find out more about these beautiful old tractors. I am glad you enjoyed the story! It was not a widely publicized event, I found out about it while researching tractor restoration. I was able to crash the potluck and hitch a ride on the wagon by promising blueberry pie! 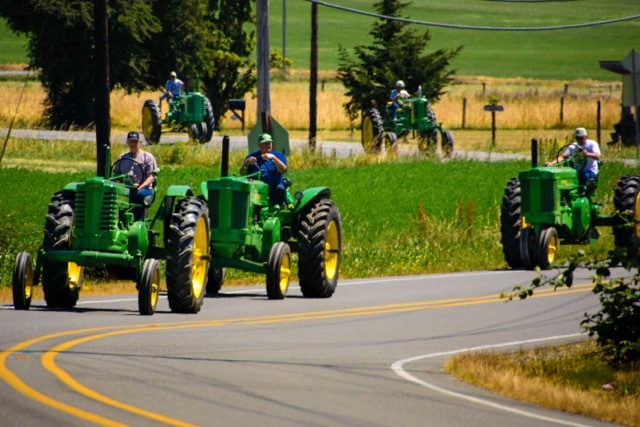 The unexpected surprise of a tractor parade is only one of the reasons I love Whidbey Island, and never go anywhere without my digital SLR camera. 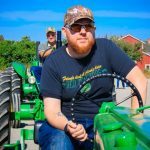 I loved this article about the tractor parade. My husband Roger Purdue and son Wilbur also loved these old tractors. What a fun event and I appreciate your bringing this to print for everyone’s enjoyment. Great comments, the parade was so much fun. I heard that Wilbur and Rodger also have antique tractors, from Terry Welch. So glad you enjoyed the article. Thanks for writing. We enjoyed seeing all of these tractors cruising through the prairie. What a great way to honor all of the work these machines have accomplished throughout the years! Great pictures and story.